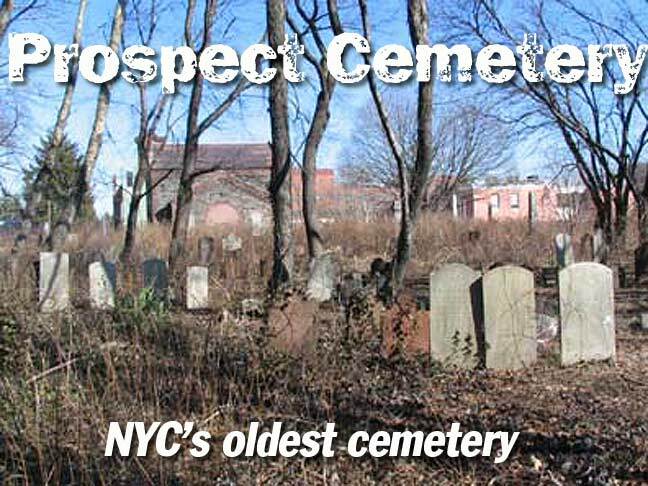 Prospect Cemetery in Jamaica is probably the oldest cemetery in Queens, and perhaps the entire city. 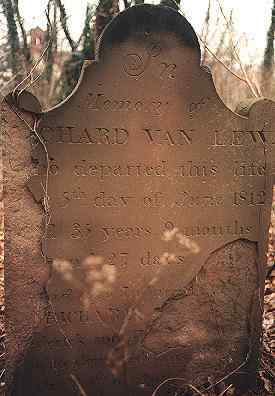 Old records show that it dates to 1668. 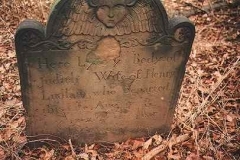 The cemetery can boast 53 Revolutionary War veterans, 43 Civil War veterans, three Spanish-American War veterans, and many interments of prominent Long Island families such as the Lefferts. 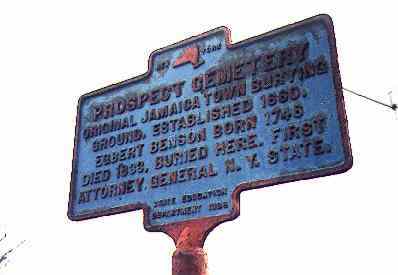 Prospect was designated as a city landmark in 1977. 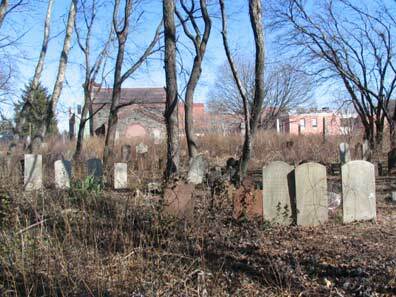 The back end of the cemetery looks like an abandoned, weedy lot when commuters pass by it when they are on a LIRR train that has just left Jamaica. 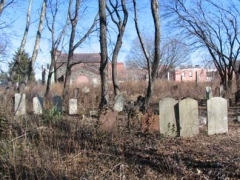 Prospect Cemetery is located on 159th Street just south of the LIRR trestle. It is alongside a long-gone pond called Beaver Pond. Because the cemetery is privately owned, New York City bears no commitment to the plot’s upkeep and it has mainly fallen through the cracks, and has slid further and further into disuse over the years. 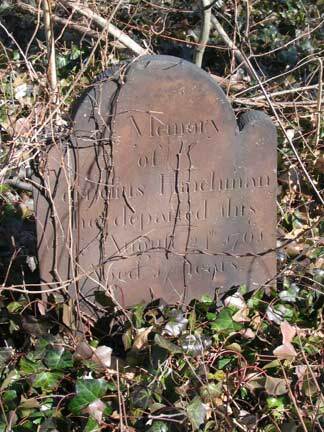 The last interment was in 1988. The Prospect Cemetery Association is dedicated to restoring the site. 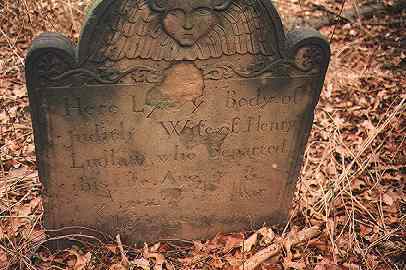 The association’s president, Cate Ludlam, says she would someday like to renovate the entire cemetery, reopen its crumbling chapel that today houses only pigeons, and repair and restore the fallen and vandalized headstones. But with an annual budget of only $3,000, which is used mainly to stave off vandalism, it’s an uphill battle. Every few months local groups and individuals volunteer to clean up the grounds. In 1999 the National Guard cleaned up the front of the cemetery that faces the street, armed with shovels and hoes. Explorer Scouts and the 103rd Police Precinct have also volunteered to help. 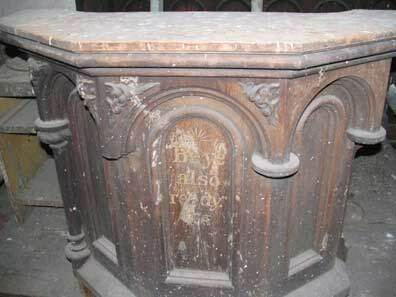 2006: Money has been found to completely restore the cemetery’s Chapel of the Sisters. Work should begin during the year. By 2011, the Chapel was restored and now hosts jazz concerts and community events. 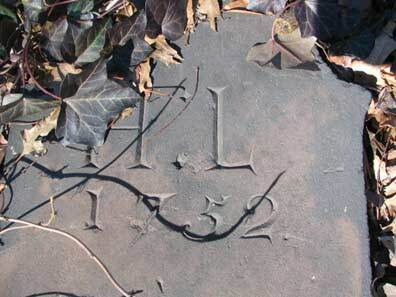 This is among the oldest stones yet found in Prospect Cemetery. Cate Ludlam, President of the Prospect Cemetery Association, is a descendant of Henry Ludlam. 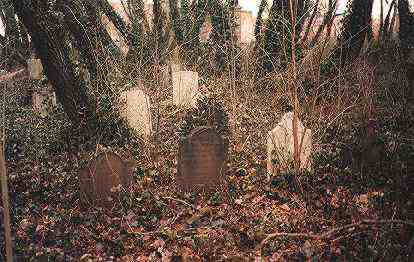 2nd from left: Here lyes interr’d the body of Anne Carle, who departed this life July 21st, 1751, aetatis suae [aged] 21. 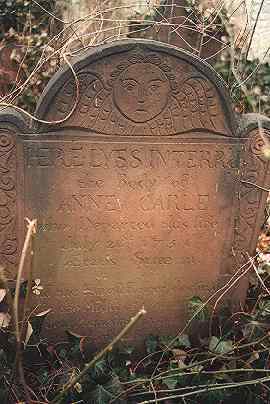 In the 1600s and 1700s, headstone carvers would often depict a winged angel head or death’s head at the top of the stone. 3rd from left: The city installed this marker outside the front of Prospect Cemetery in 1936. 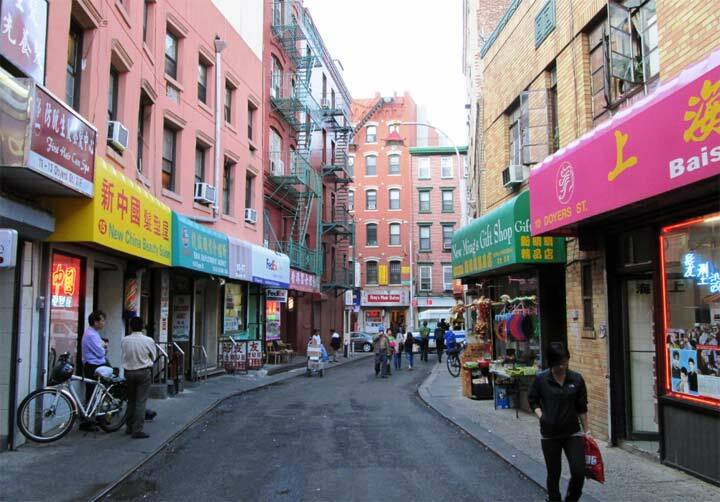 By 2011, it had been restored and repainted. 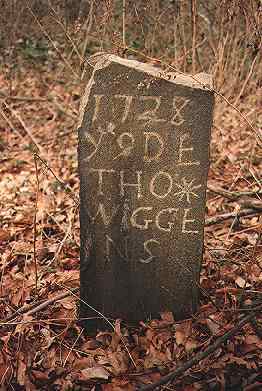 4th from left: The hastily-done shorthand on this headstone indicates that Thomas Wiggins was buried here in 1728. 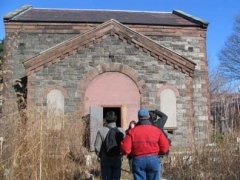 The Chapel of the Sisters was built in 1853 by Nicholas Ludlam and is named for his three daughters, who predeceased him. 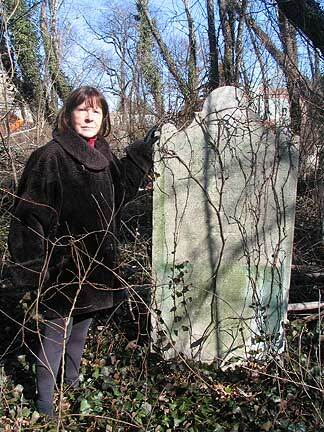 LEFT: Cate Ludlam poses for a Daily News profile by one of her ancestor’s headstones. 2nd from left: Cate stands by the stone of Egbert Benson, New York State’s first Attorney-General. 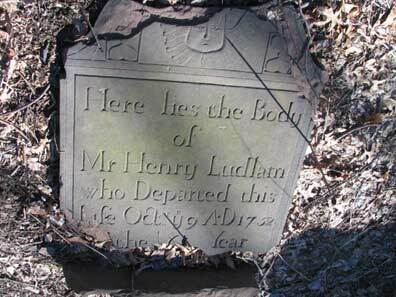 3rd and 4th from left: The head and footstones of Cate Ludlam’s predecessor Henry, d. 1752. 5th and 6th from left: Prospect Cemetery and the Chapel; the pulpit, formerly deteriorated, is now restored. 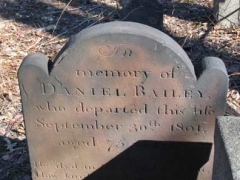 For more information, or if you would like to help the Prospect Cemetery Association restore the plot, you can contact Cate Ludlam at her e-mail address, CateL@aol.com. I’ve met her and she is very dedicated to making Prospect Cemetery the landmark it deserves to be.